As a working mum of two, I know how hard it can be to get both myself and my family motivated about exercise. When I come home from work exhausted and my kids are pooped from a long day at school, the last thing on our mind is getting up and doing something physical! However, after I noticed that both myself and my kids were getting a little on the chubby side, I decided to take drastic and immediate action. I constructed a plan to make sure that each of us got at least 30 minutes of exercise every day, and we now look a whole lot better but we also have much more energy too. Get yourself and your kids signed up for some fun, energizing activities. You can join a gym or simply sign up for a fitness class. For the kids, you could sign them up for local sports clubs, send them to an outdoor adventure school or register them for dance classes. Whether this means simply taking the stairs to your office or getting your kids to walk your dog daily, there are plenty of opportunities to increase your daily walking time. Walking is perhaps the least strenuous form of exercise but it still has substantial health benefits. You can liven up walking time by listening to your iPod or walking with friends. Turn your kids exercise periods into a fun experience by incorporating active games and competitions. Reward small prizes to the winners and always be supportive of your kid’s efforts in being more active. 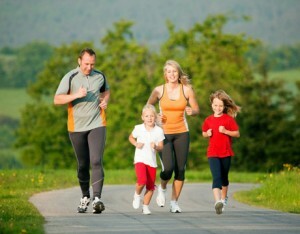 Steps such as these allow both yourself and your kids to associate exercise as a rewarding as well as a fun activity. Join a local sports team and encourage your kids to try out for teams at school. The comradeship found in teams can be highly motivating and it is an excellent way to get into shape while simultaneously having a good time. Go to your kids games and tell them how proud you are of their sporting achievements – it will really help motivate them to stick at it. Although exercise should be a regular occurrence, make sure you take a day off from time to time. This will allow your muscles to recuperate and recharge and you can use this spare time to spend quality time with your kids. Go to the movies or visit a local attraction and then get back on your exercise agenda the following day. As you can see, there are plenty of ways you can incorporate exercise into your everyday lifestyle. Follow these easy to remember guidelines and you and your family will do great! Good luck!